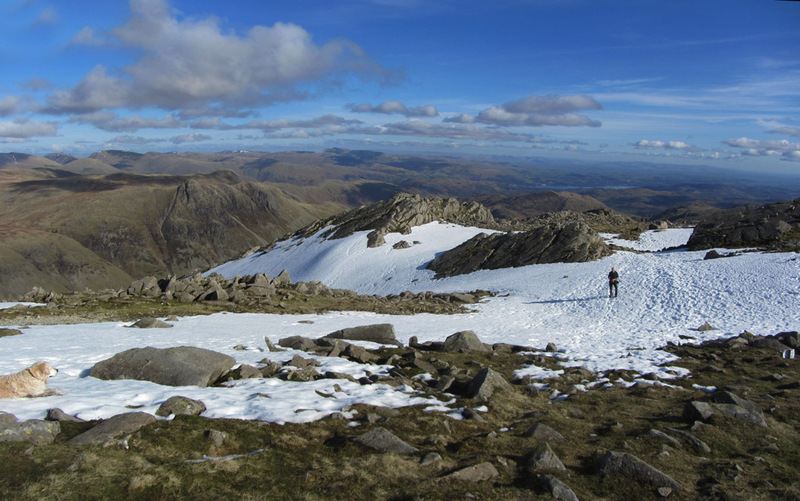 " Bowfell for our third 214 "
Date & start time: Monday 10th March 2014, 11 am start. 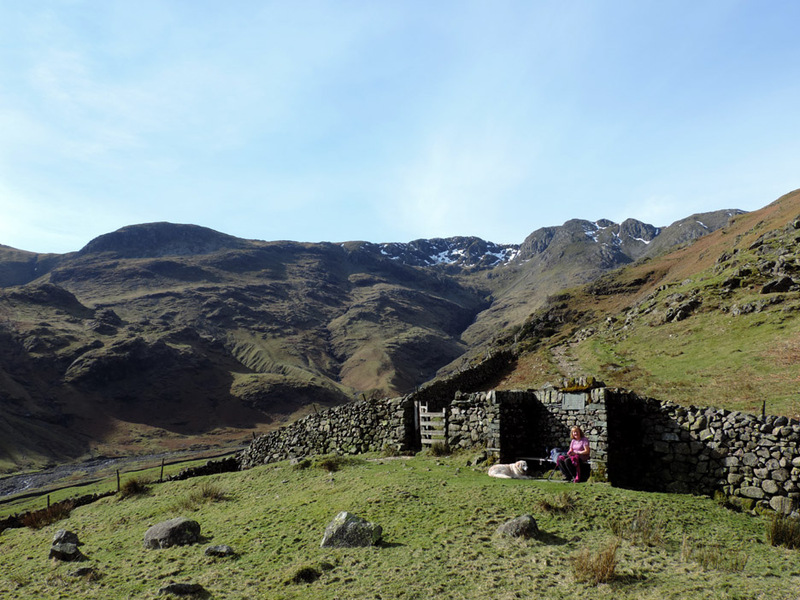 Places visited : Stool End Farm, The Band, Three Tarns, Bowfell and back the same way. 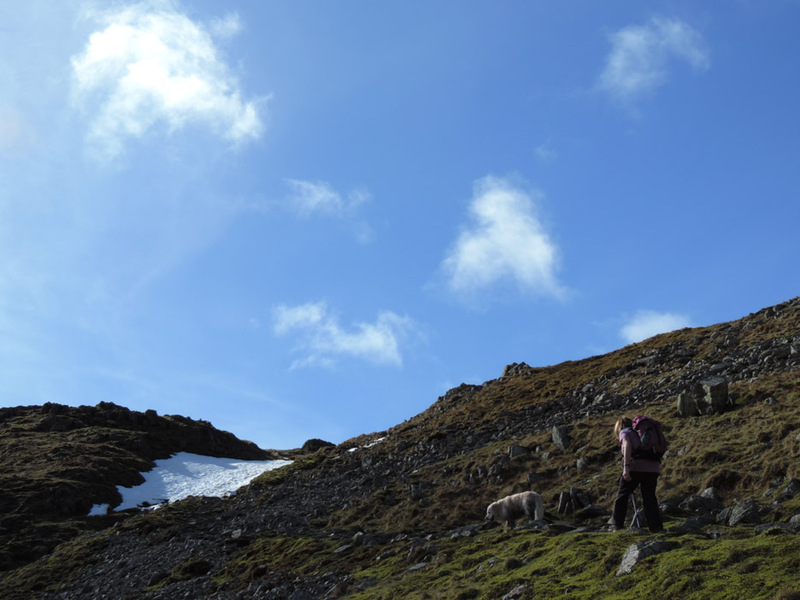 Walk details : 6.5 mls, 2630 ft of ascent, 6 hours 25 mins. 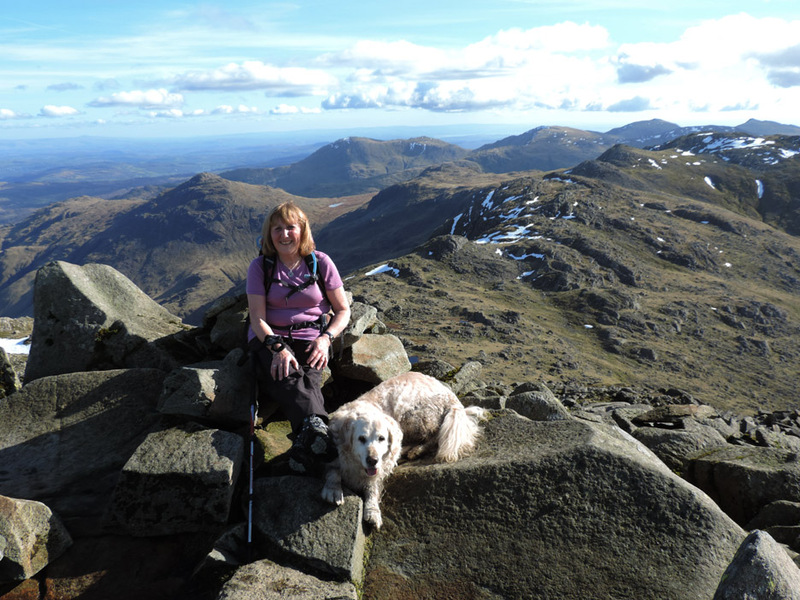 Highest point : Bowfell, 2,960 ft - 902m. 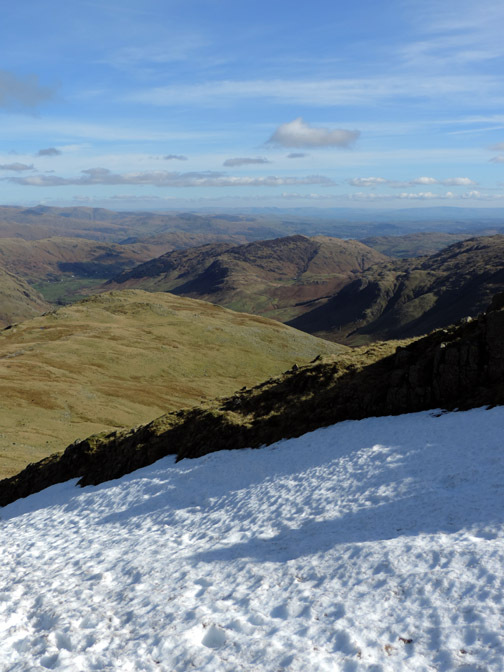 to summit each of the fells highlighted in Alfred Wainwright's Lakeland Pictorial Guides. 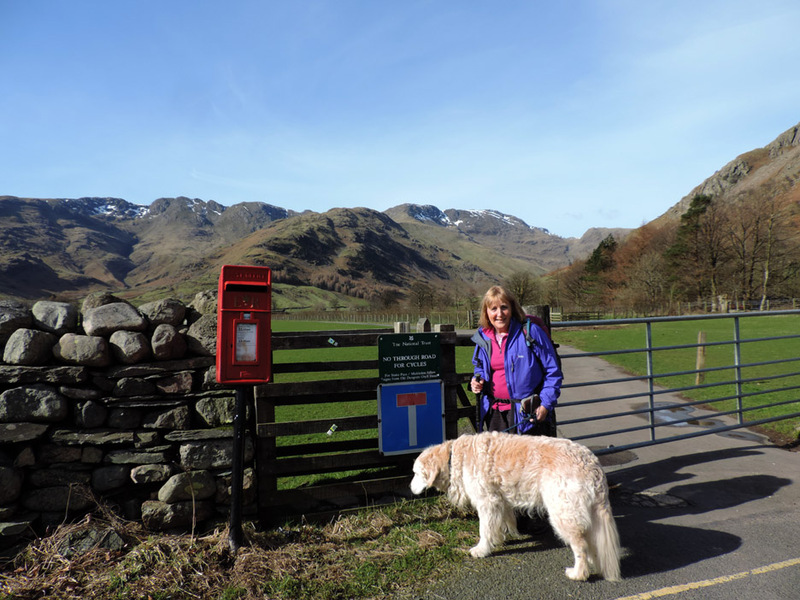 Today the weather forecast promises to be good which could allow us to complete another circuit of the 214 fells. 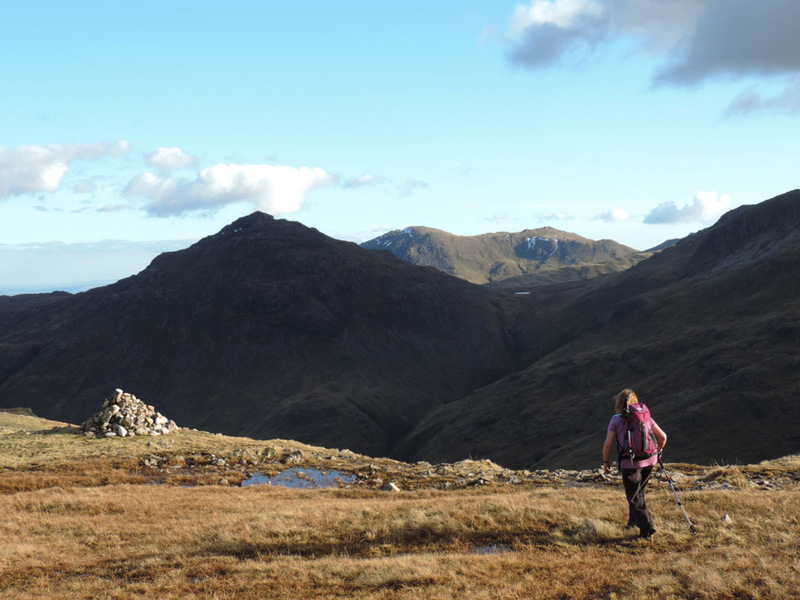 and are faced with a panorama in front of you that causes the adrenalin to rise at the prospect of a great walk ahead. 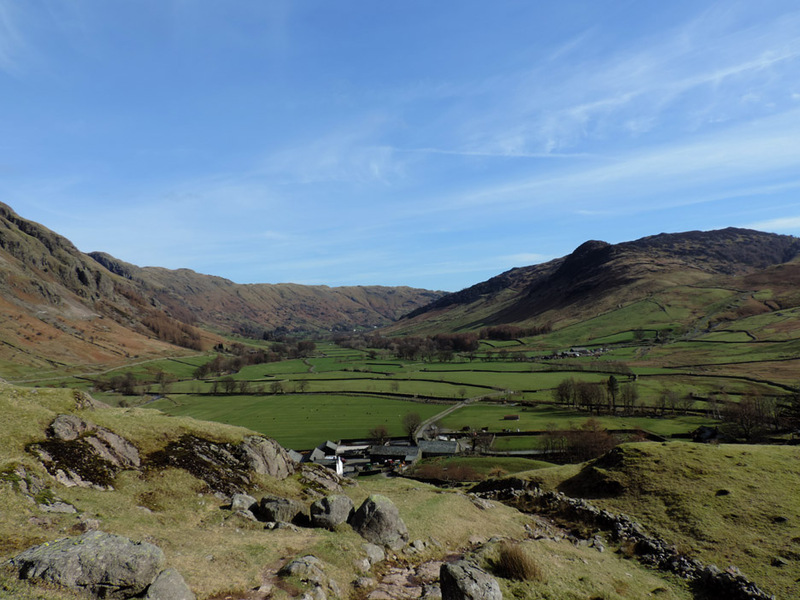 Below is Elterwater . . . all round the weather is living up to the perfect forecast. 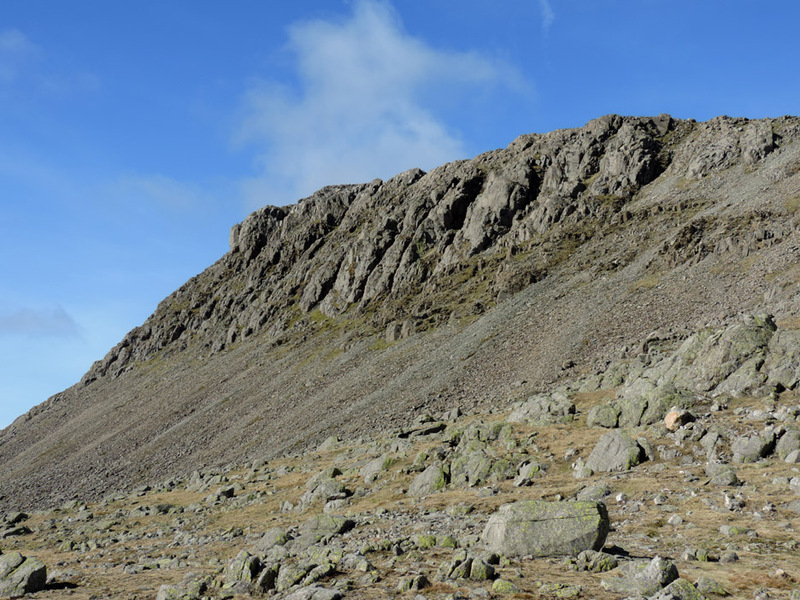 the only mountain in the Lake District we haven't climbed on our third round of Lakeland Fells. 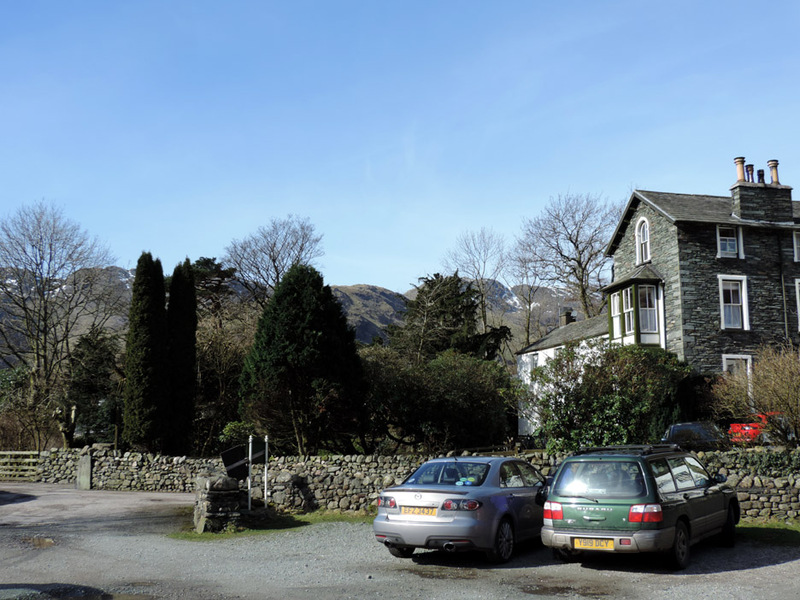 Parking was easy today as there were no summer crowds in Langdale. 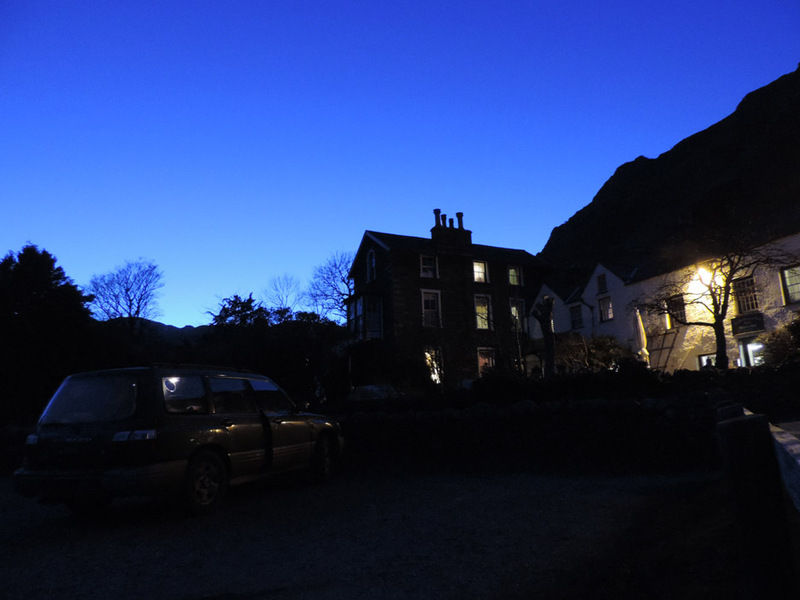 We're slightly later having travelled round from Loweswater so the main car park is full. Under way at 11 o'clock, we enter the fields of Stool End Farm with the prospect of our climb ahead. 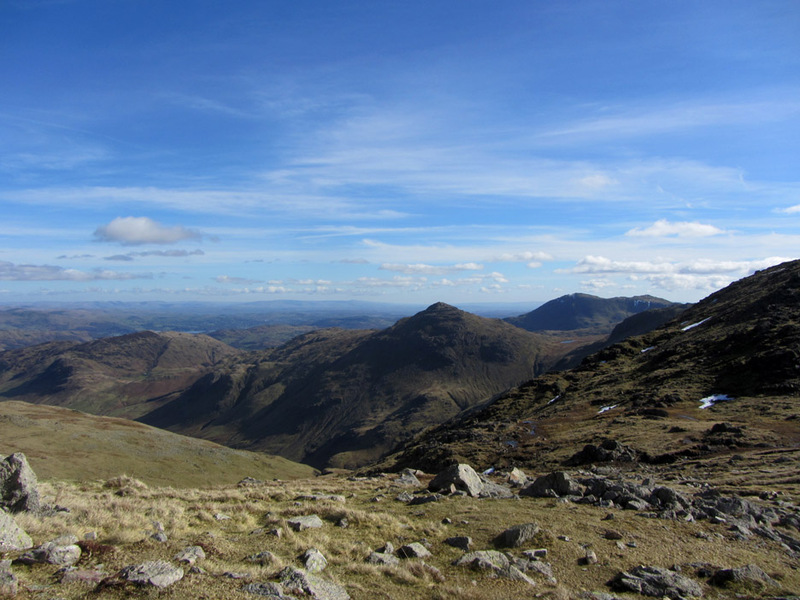 The craggy ridge in the centre is The Band and the summit of Bowfell is just to the right. 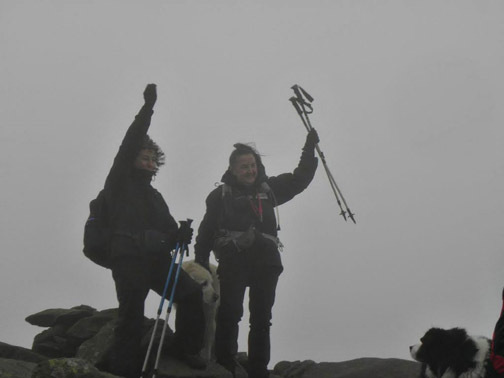 With a poor Autumn and Winter without much good walking weather we're a little unfit, but here goes ! 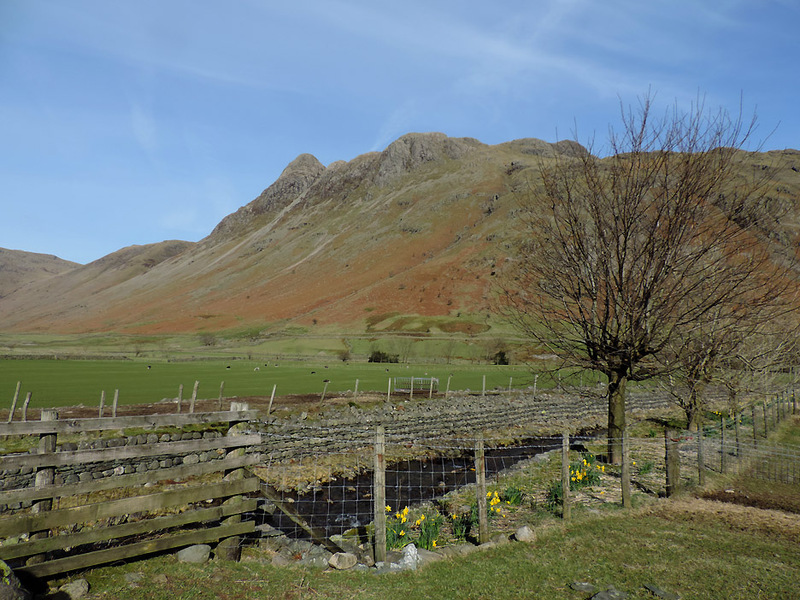 The daffodils are out in the valley as we cross Oxendale Beck. 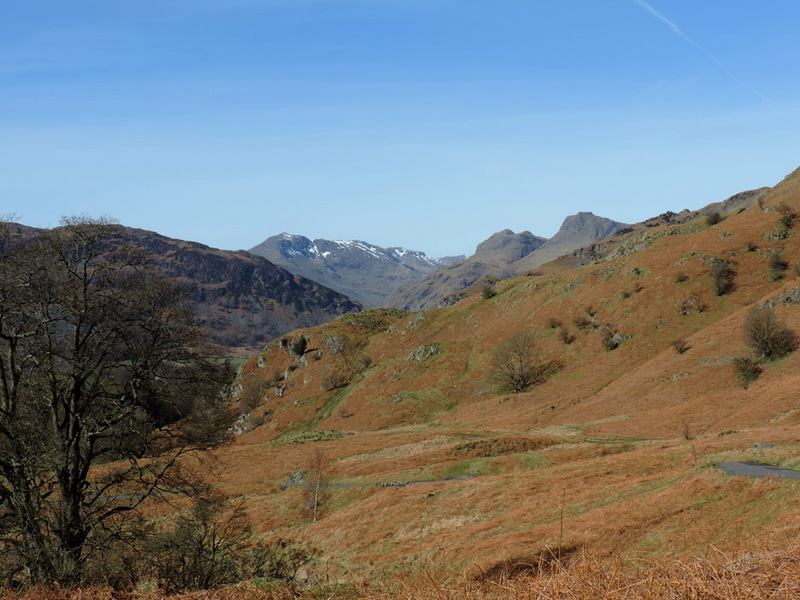 Behind are Pike O'Stickle and Loft Crag, with Harrison Stickle behind and to the right, behind the tree. The path takes you through this working farm and out the other side. The flat aspect of the glacial valley really shows up here. 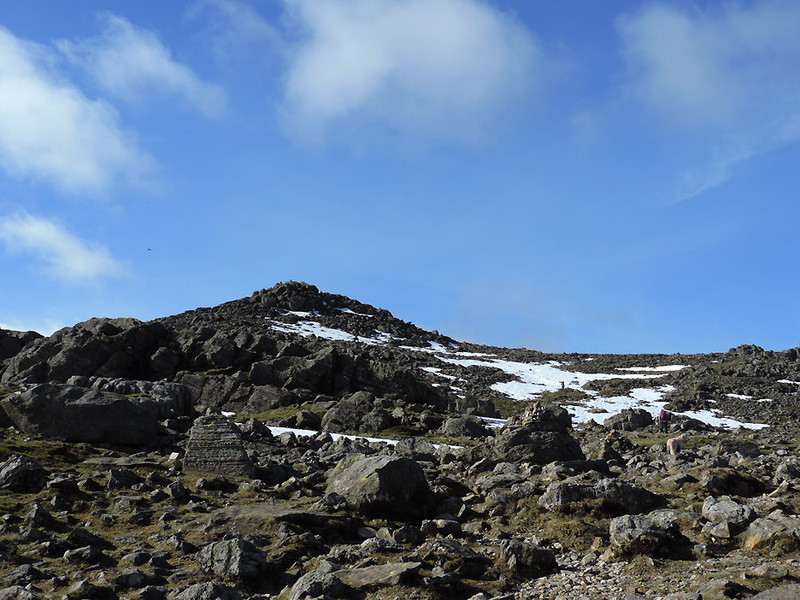 Side Pike is the darker crag above the yellow JCB. 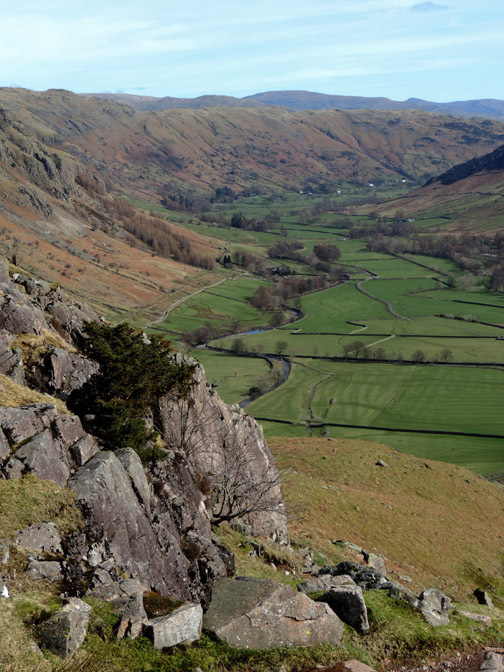 Time to start climbing and as we do, the view improves and widens to include the summit of Lingmoor. 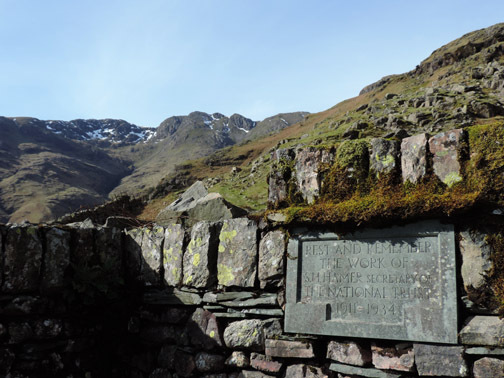 Built into the out-take wall, the last barrier to the open fell, there's a memorial seat that has been built just next to the gate. It would be churlish not to use it ! Onward and upward on a well pitched path. We leave the valley bottom further behind. An easing of the slope as we climb towards the top of The Band. 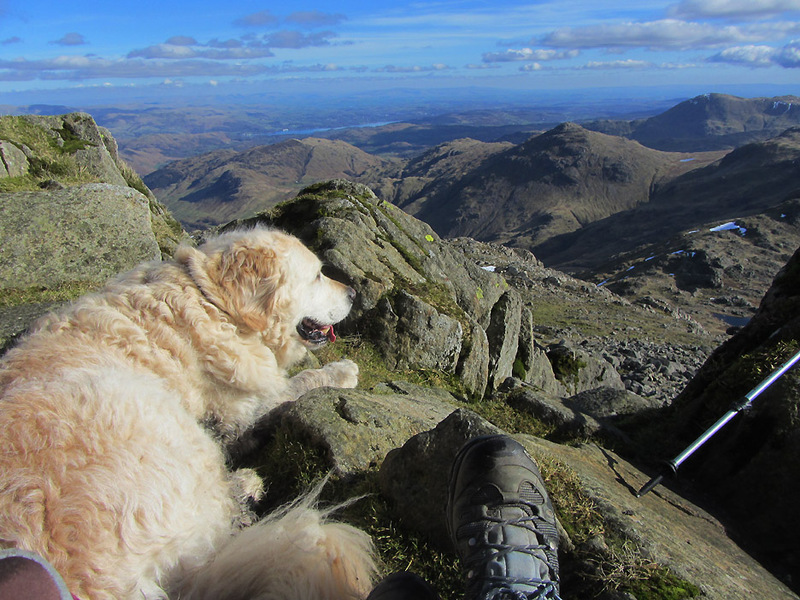 From here on we'd be climbing Bowfell itself. We thought about diverting off to the right to walk the Climber's Traverse and the Great Slab, but we'll keep it simple today. 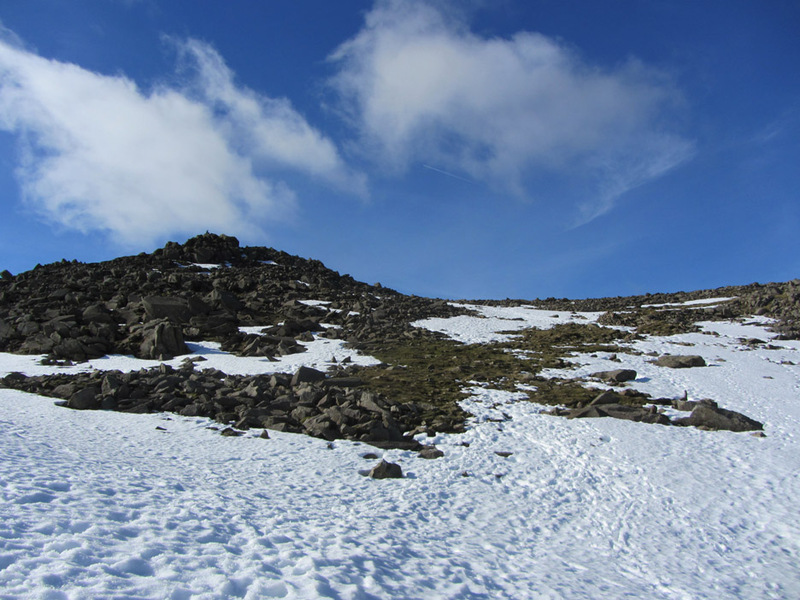 There's also the prospect of snow on the eastern side of the fell so climbing the Slab could be problematic without the proper equipment. 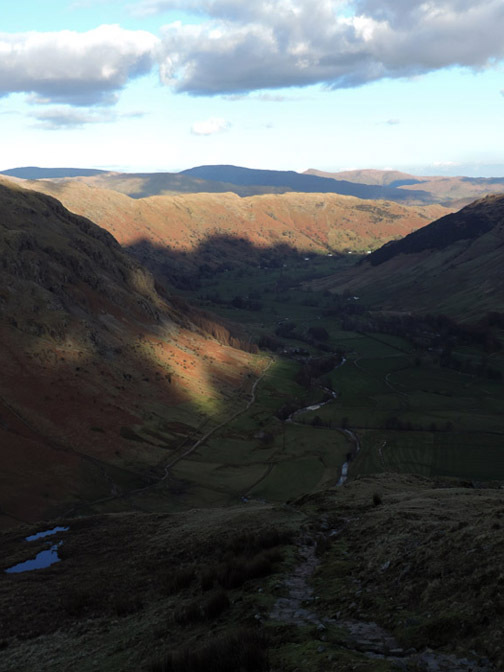 As we continue to climb up to the left, we say goodbye to the valley of Mickleden for a while. A patch of snow covers the path ahead . . . it could be easily avoided if you really wanted to. Harry and I didn't, but he fared better with his built-in spikes ! There's a great view across to the distant Yorkshire hills. 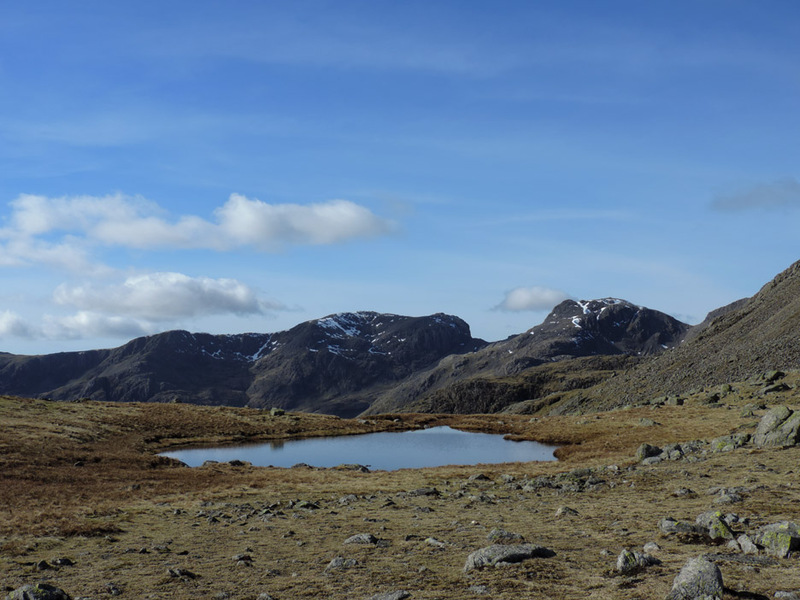 The coll between The Crinkles and Bowfell is relatively flat and home to three large pools of water. These vary in depth according to the season . 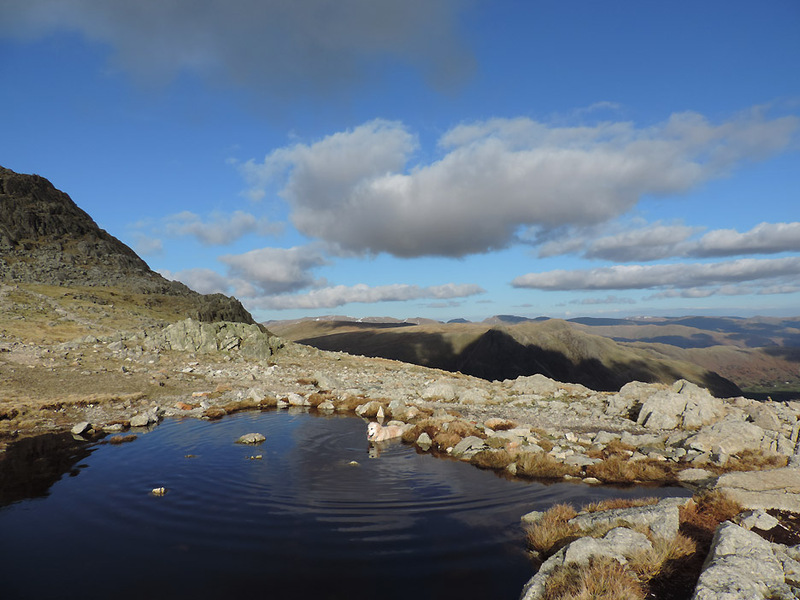 . . so today the Three Tarns are full to the brim. 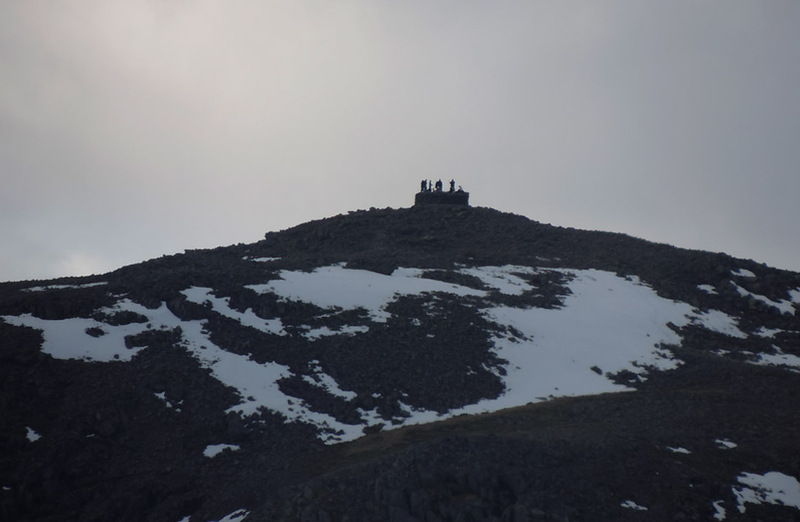 and Scafell Pike, the highest in England by a mere 14m or 48 feet. 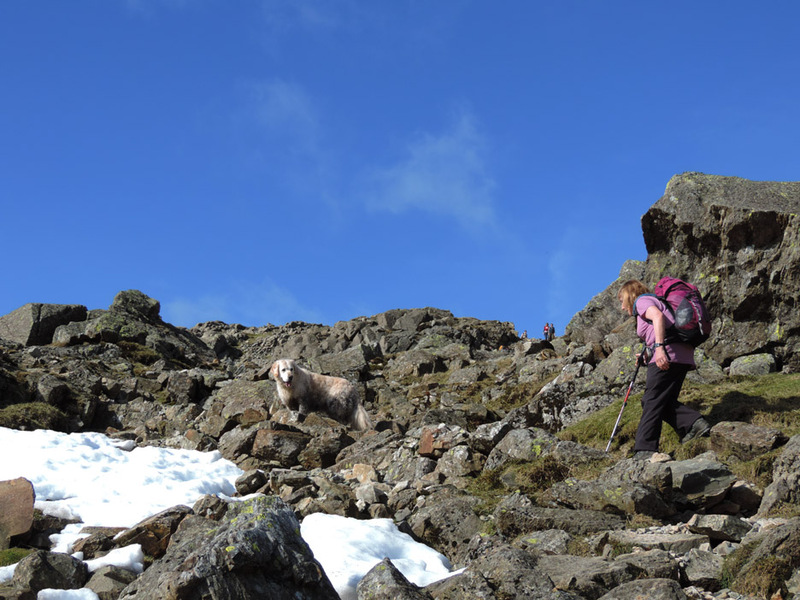 To our right here, to our left as we climb are the the steep cliffs known as Bowfell Links. 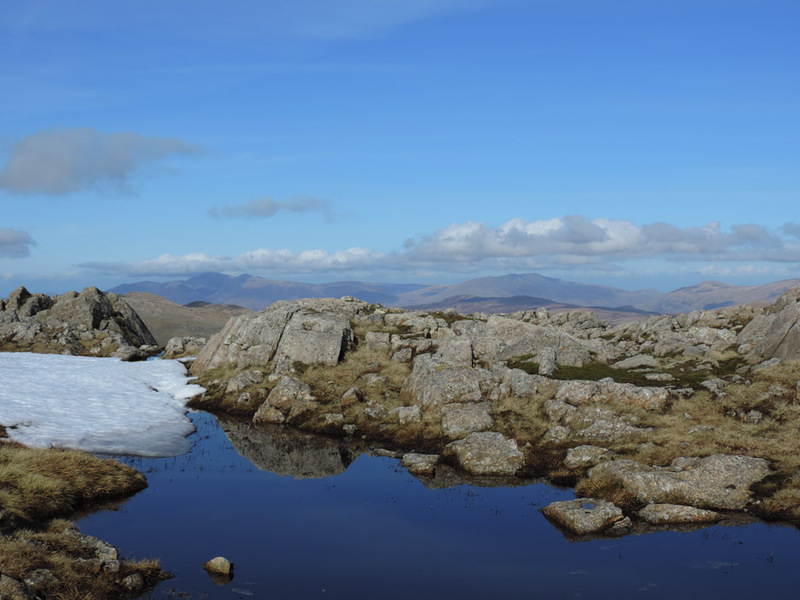 From a little further up, all the three tarns are in the same photo. 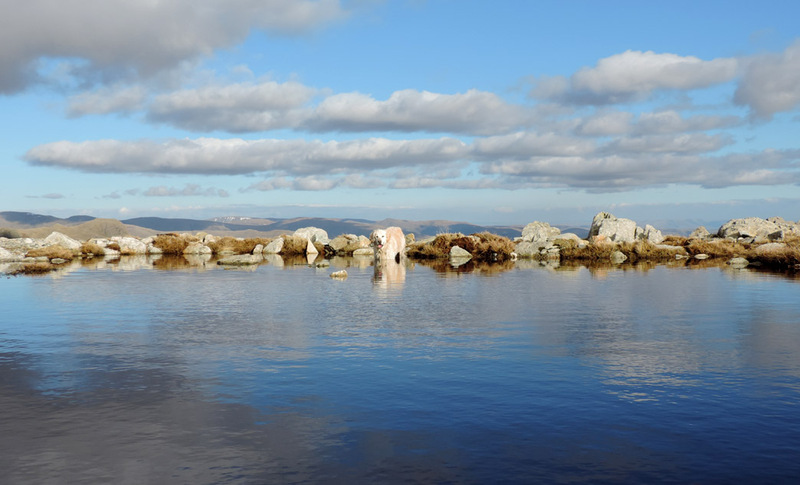 It is such a beautiful day that we take a few minutes out to sit and enjoy the view. 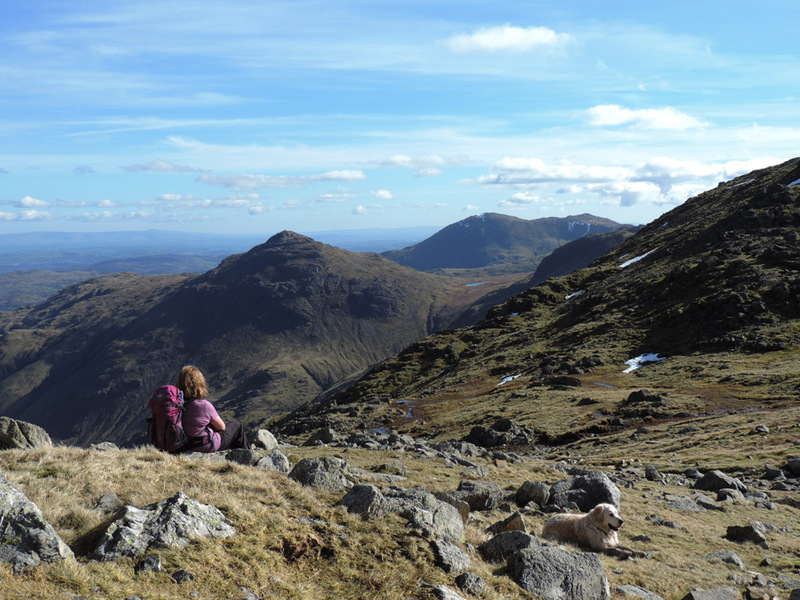 Behind us as we climb are Lingmoor, the triangular Pike O'Blisco and the bulk of Wetherlam and Black Sails. Better turn round now . . . as I might fall over if I don't look where I'm going ! 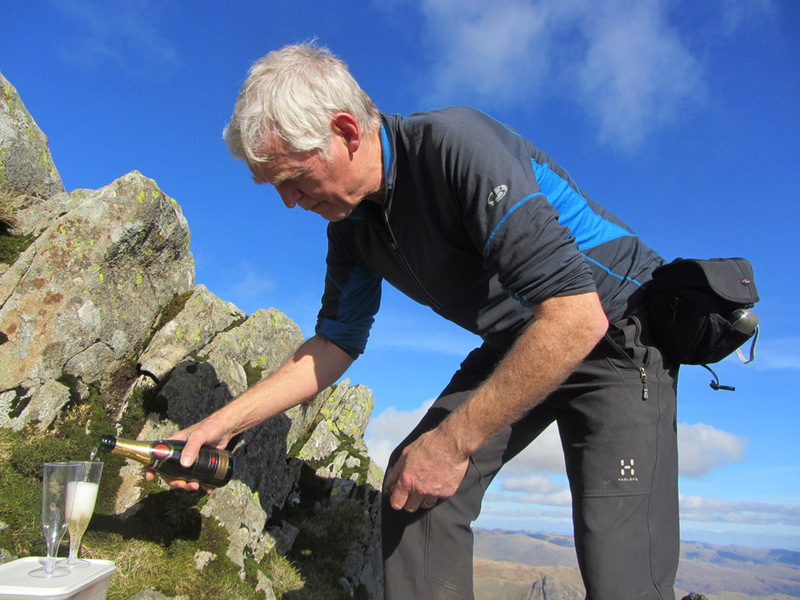 as we take on the challenge of the final half hour of the ascent to the summit. 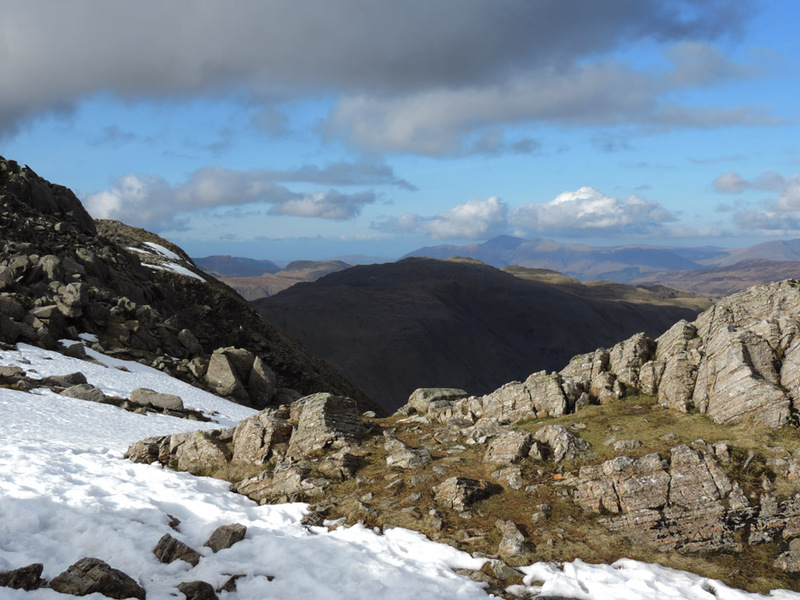 The Skiddaw fells now appear in the distance, behind the darker bulk of nearby Glaramara. 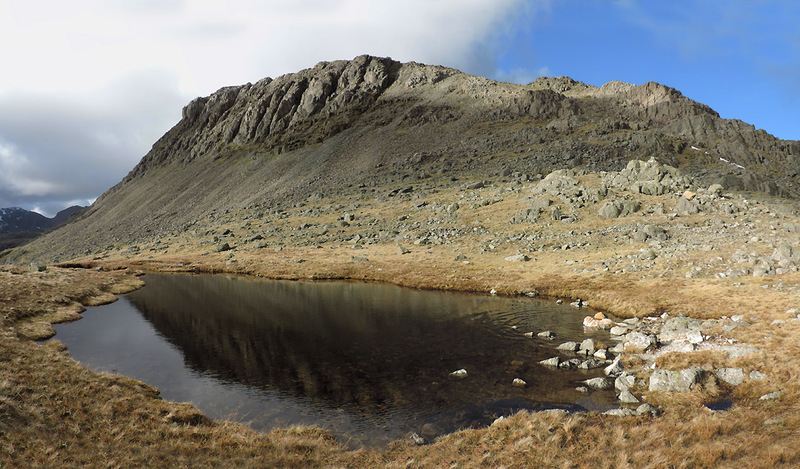 A magical little tarn added to by the melt water of the summit glacier . . . I mean that small patch of snow ! Hold your cursor over the picture to see his expression. 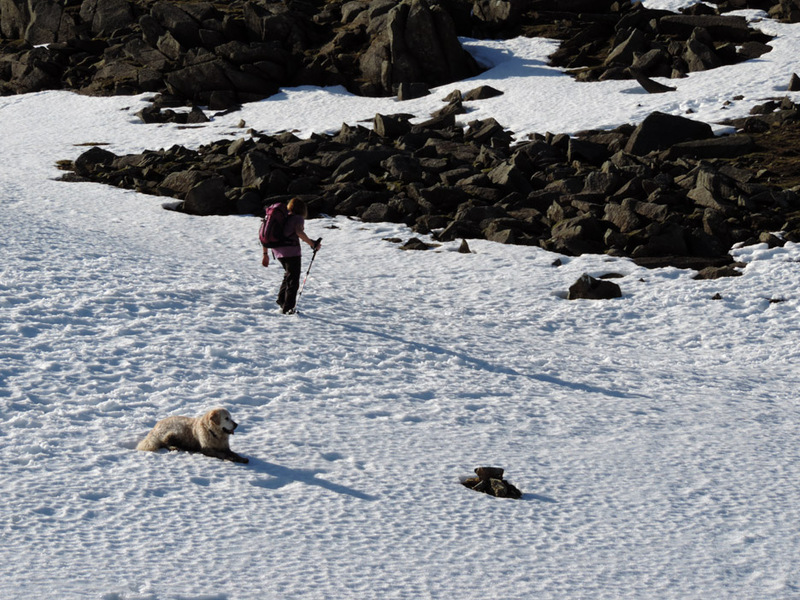 so it is relatively easy going as we cross the rock-strewn plateau towards the summit. 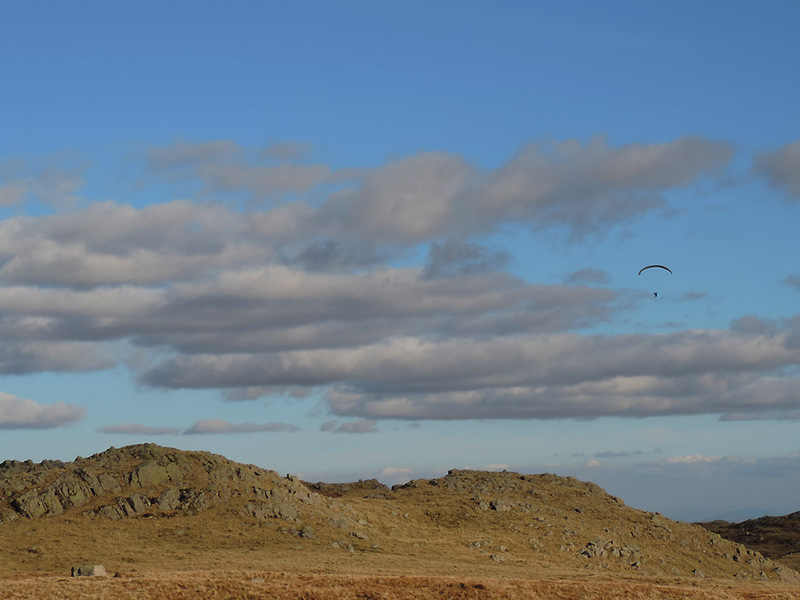 the inclined rock formation that is a feature of this eastern side of the fell. 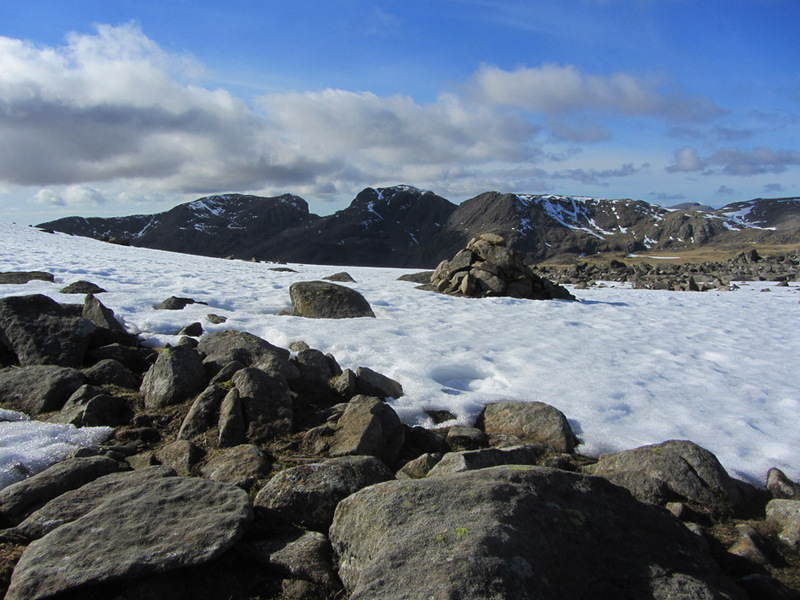 As we thought, there is a fair amount of snow on the slab and it wouldn't have been a good way up for us today. 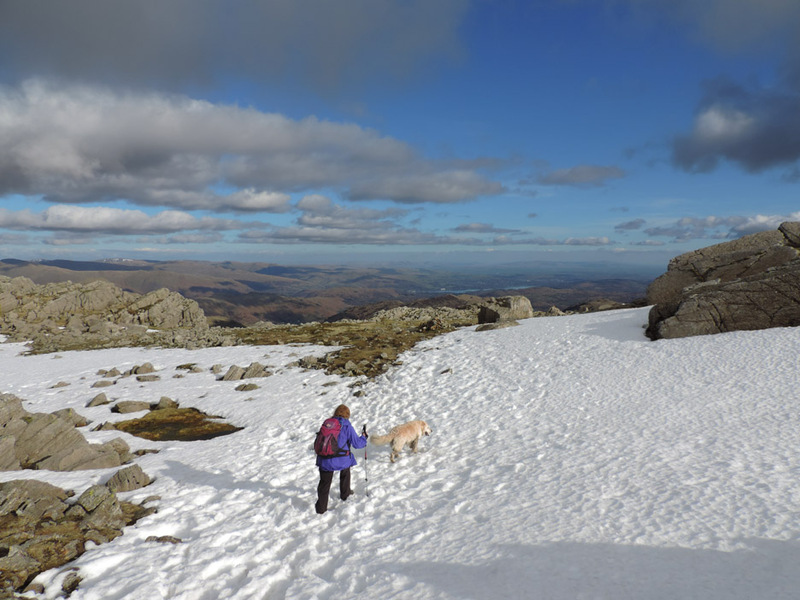 I cross the snow towards Ann and leave the slab for another, less wintery day. The rock I was standing on for the last photo was the one behind my right shoulder. We stay on this side for a less rocky and less snowy approach to the top. 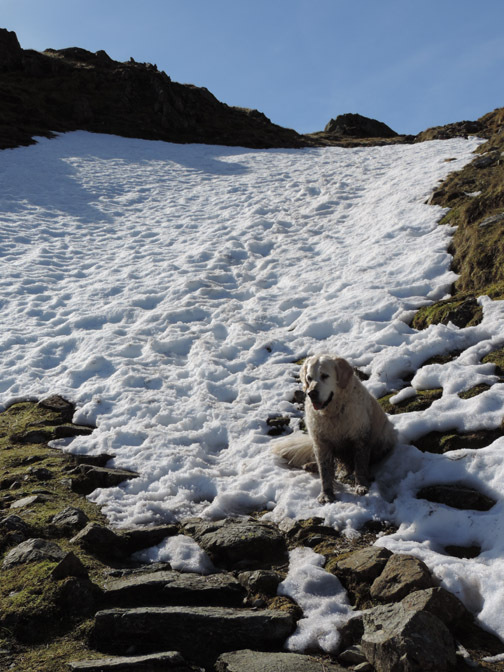 Which ever way we chose today there was a snow patch to cross. 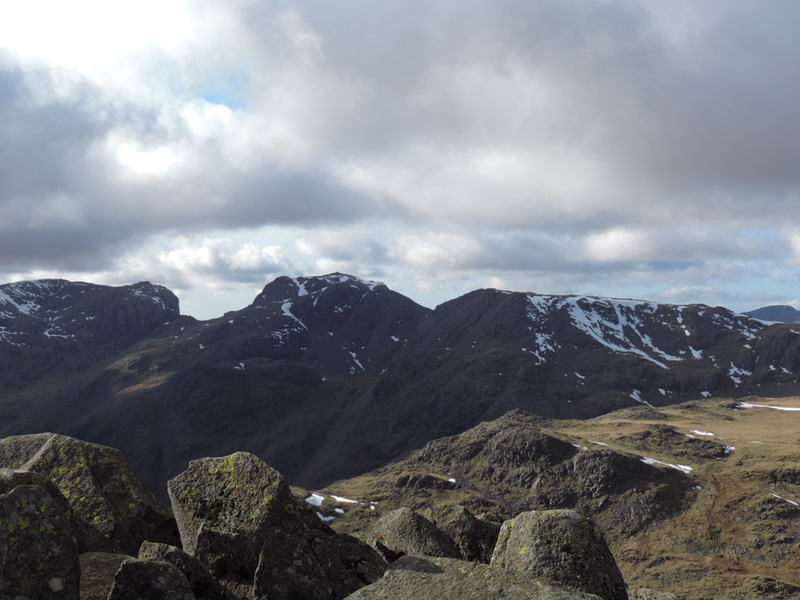 A new view of the Scafells, this time from the right hand side of the fell. 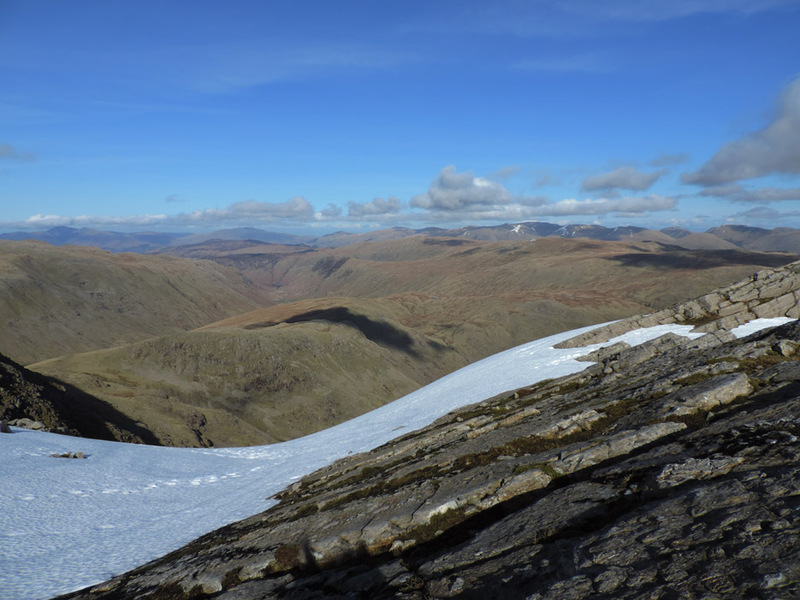 The snow was frozen hard but every now and then footsteps would collapse into a gap below the crust. Taking a slightly less direct route made the going easier. 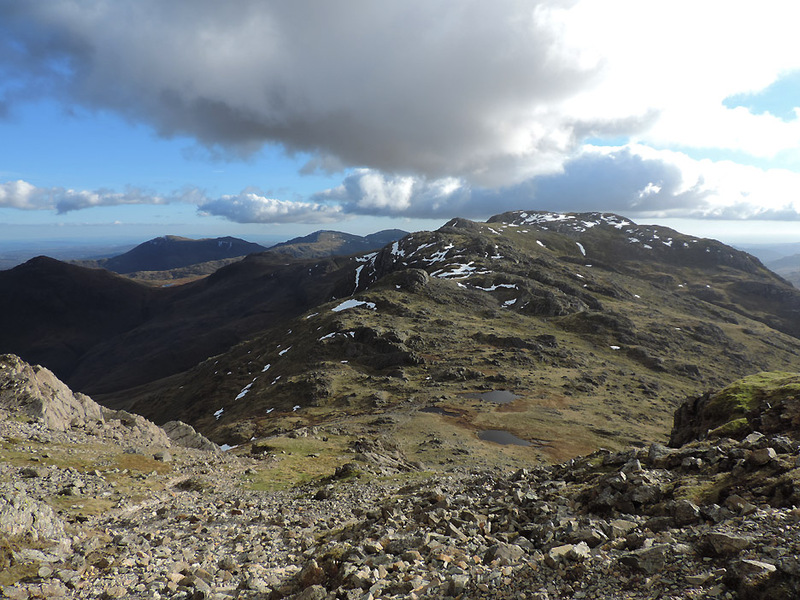 Scafell Pike dominated the view from this side . . . I wonder how many people are on top today ? I steady the camera and utilise the full zoom with surprising results ! But I digress . 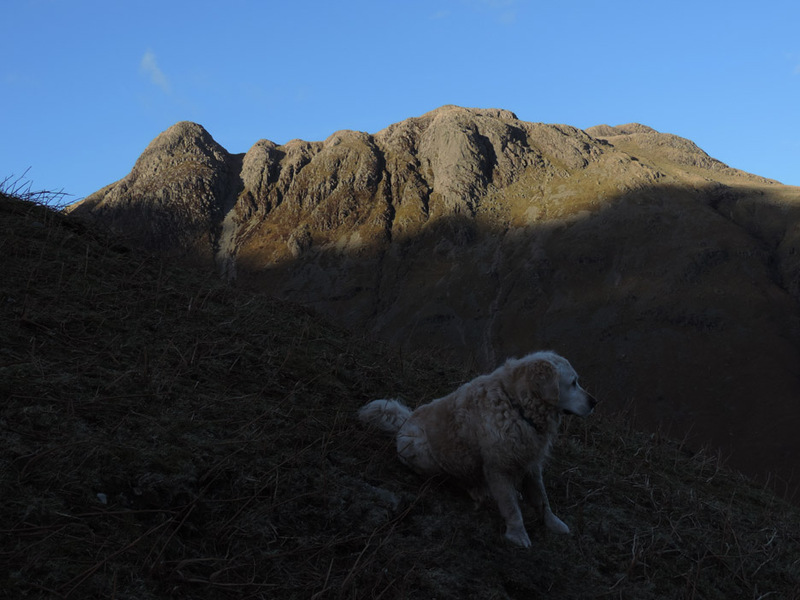 . . above us is the summit we're more interested in today. and let's not forget, it was the final fell of Harry's second round too. 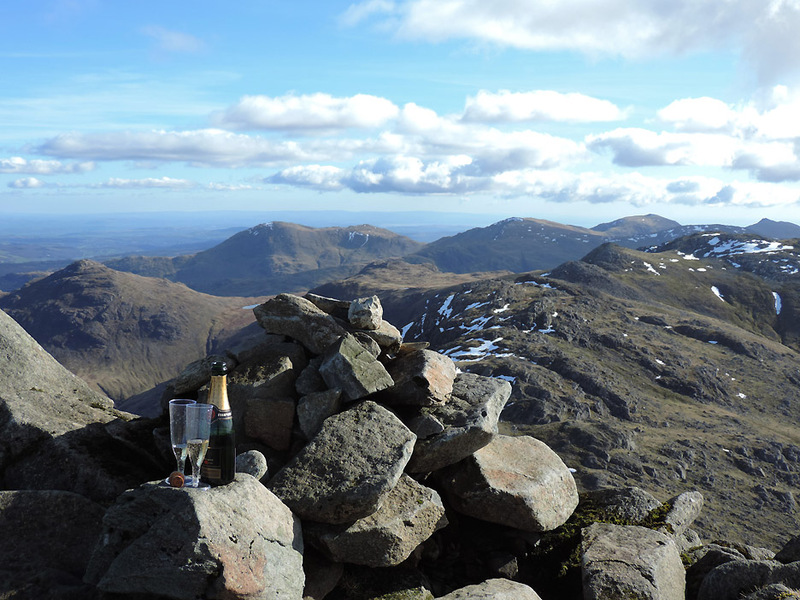 Time to break out the Champagne and raise a glass !
" 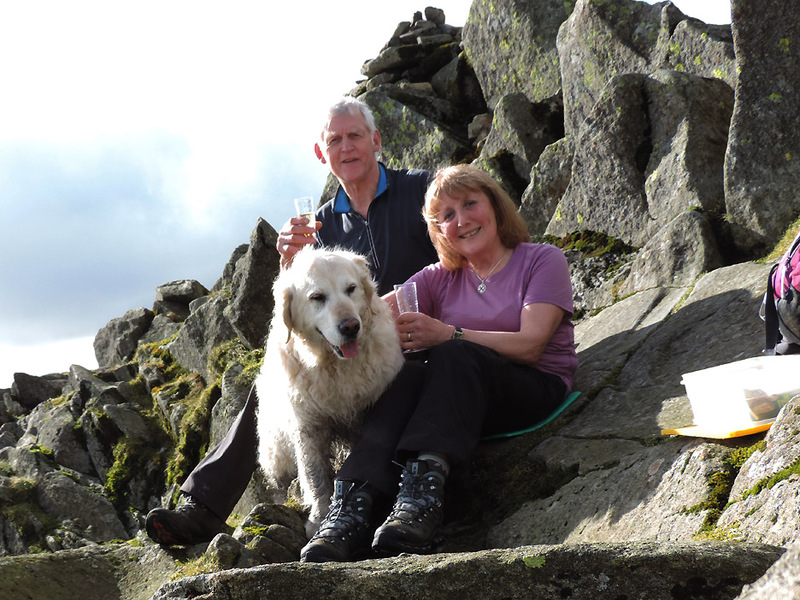 To the enjoyment the fells have brought us over the years" . . .
. . . " and to absent friends, particularly our lovely dog Bethan." just one short, we believed, of reaching that same second round doggy-completion. 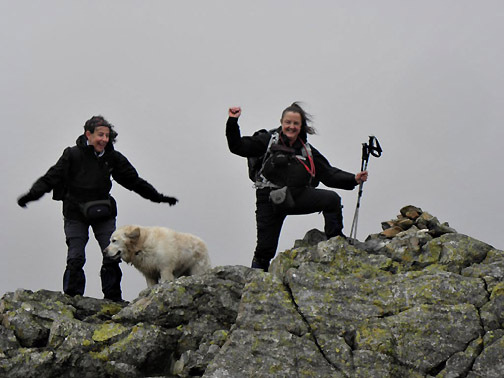 However when we thought about it, we realised that she had managed to walk this fell a second time on a walk with Angie, Jill, partners and friends when Ann and I were abroad on holiday. 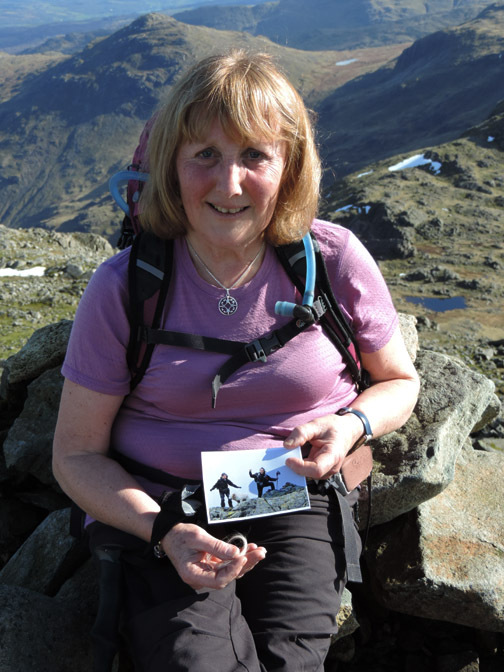 Ann brought photos of that day and a lock of Bethan's fur on our walk today. 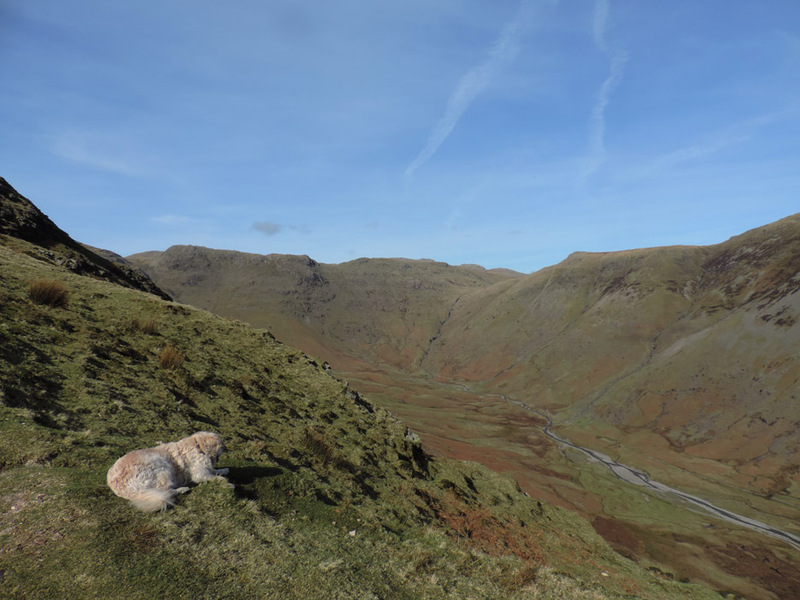 She had completed her second round of the Lakeland Fells before us after all. Time for a toast to the camera . . .
We had the place to ourselves so the self-timer had to press the shutter in order to record our combined celebration today. Time now for a lunch in the sunshine and enjoy the surroundings. 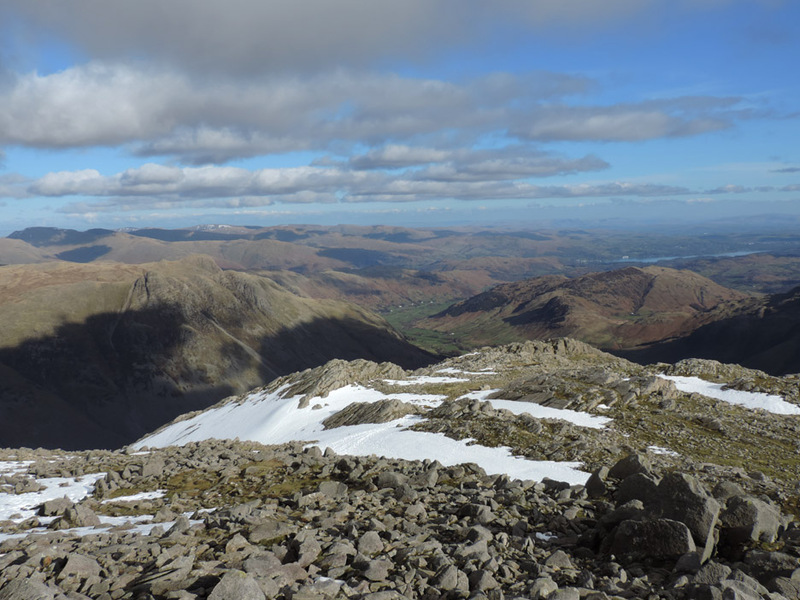 The view from the summit of Bowfell. What a lovely day to complete the round . . . cheers ! and could walk off towards home without being too light-headed. We chose to take the same route back down. 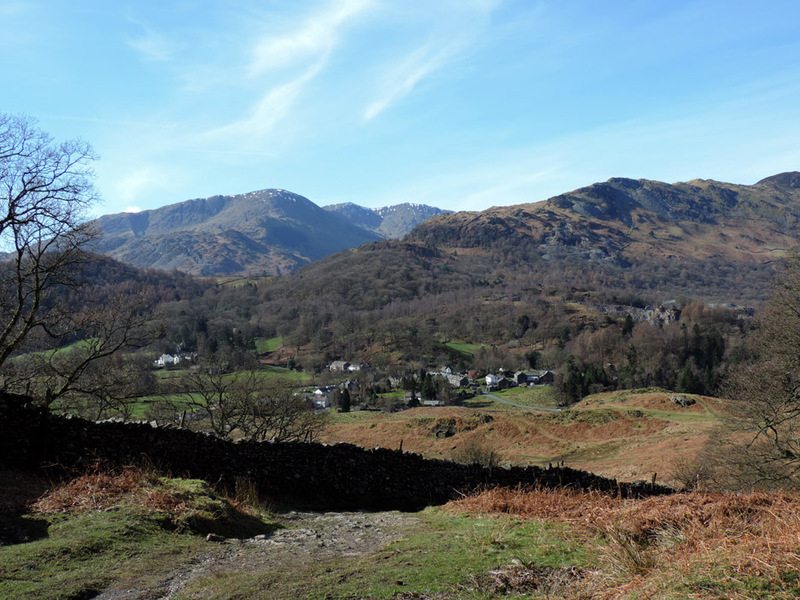 Ahead of us now was the view of Langdale Valley and Windermere . . . no need to keep looking behind. 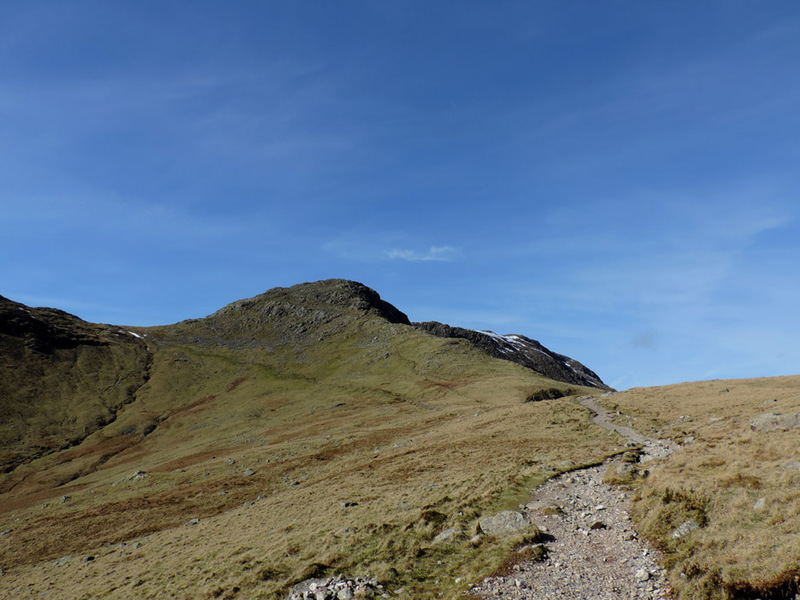 Three Tarns and Crinkle Crags ahead. 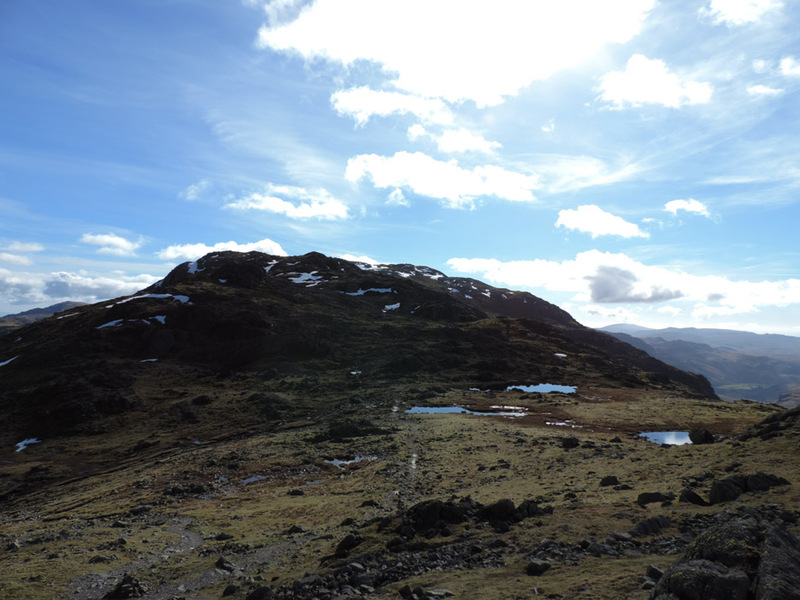 On a grass-covered bluff below us a gentleman started to empty his rucksack. We thought he might be setting up a late afternoon campsite . . . but that would be a mighty big tent. 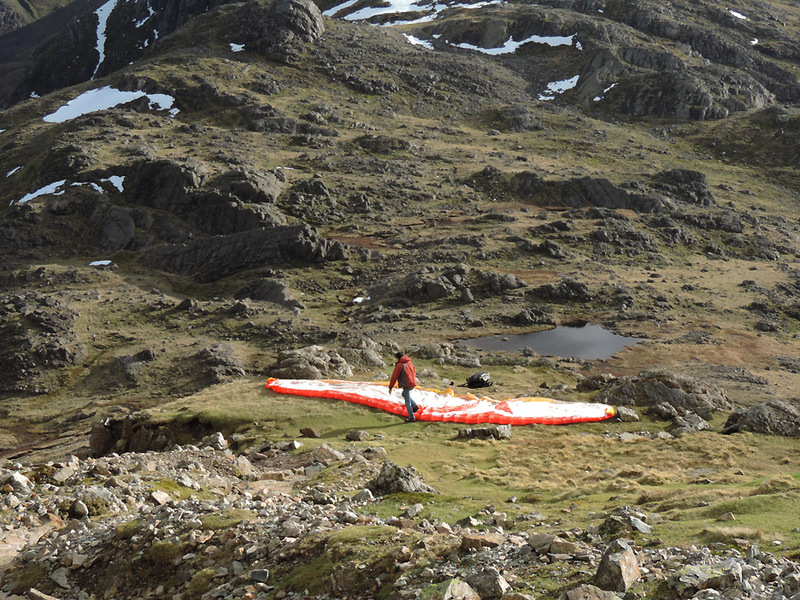 His plan was for a quick descent to the valley using his paraglider . . . we asked for a lift but to no avail. 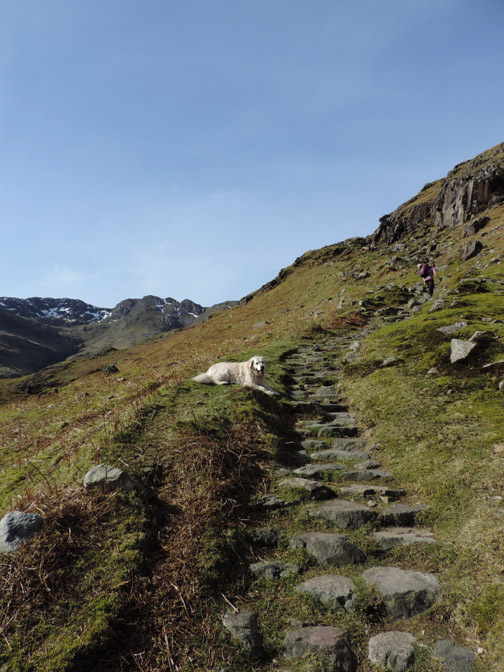 Down by the tarns again . . . just crying out for another photo . 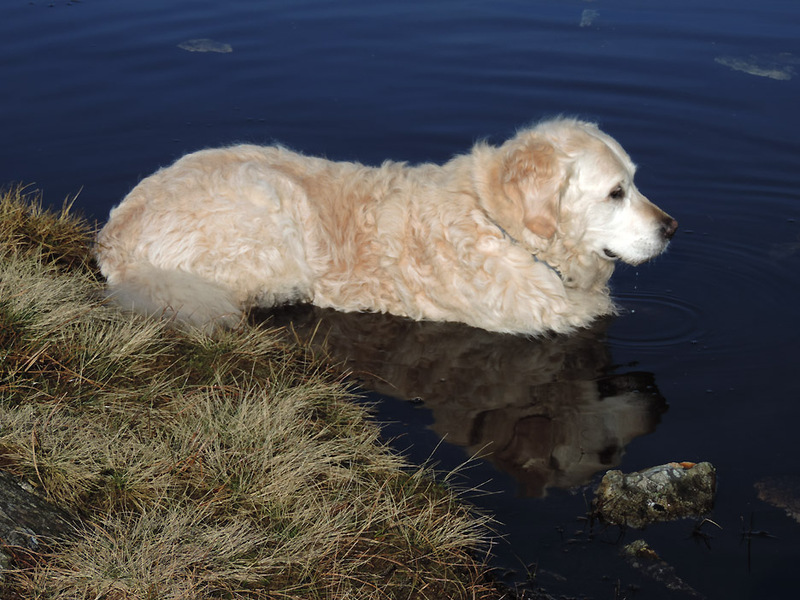 . . but who's making those ripples ? 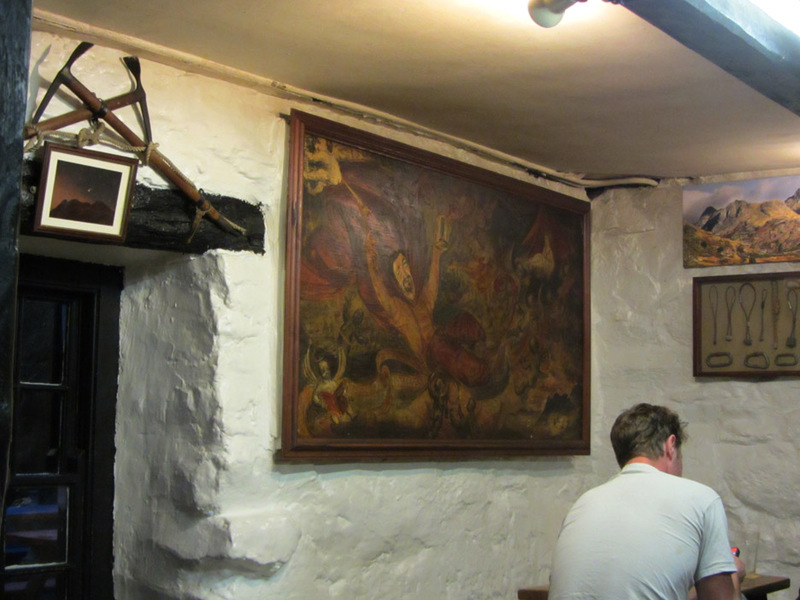 If I'd set it as a competition how many would have recognised this location . . . It could even have been the south of France or some Greek island with that sunshine. 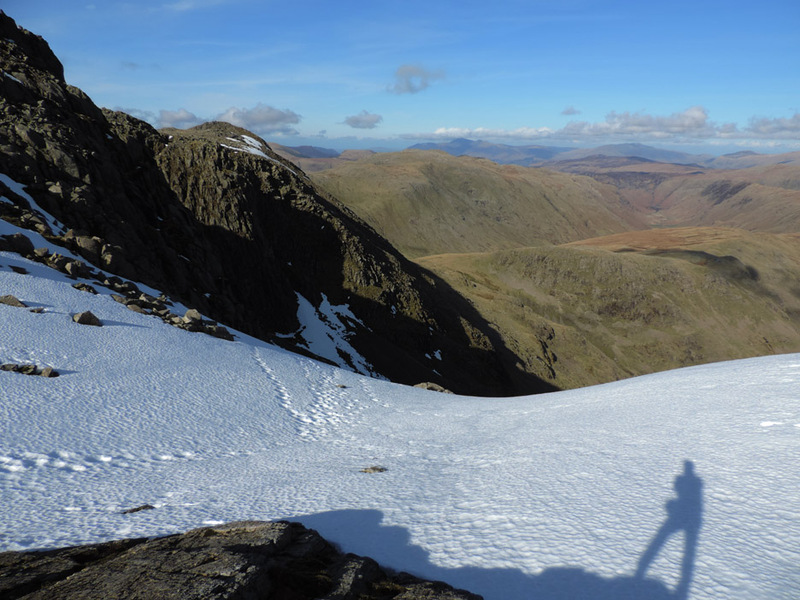 Sunshine and shadows as a build up of cloud to the west casts a shadow on Pike O'Blisco. 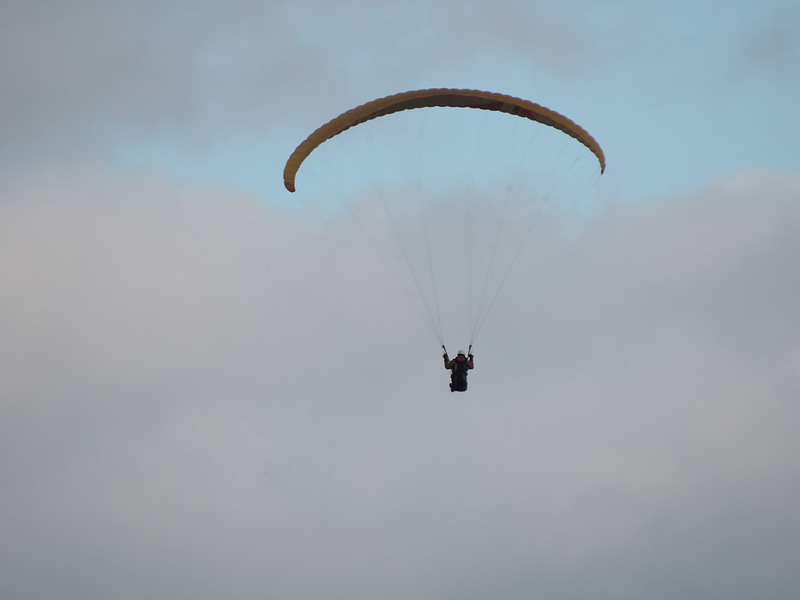 Above us the paraglider flies silently by. He'll be down to the valley floor long before us. Last sighting of him, the valley below, the moon above. No sign of him now over the sun-dappled valley. 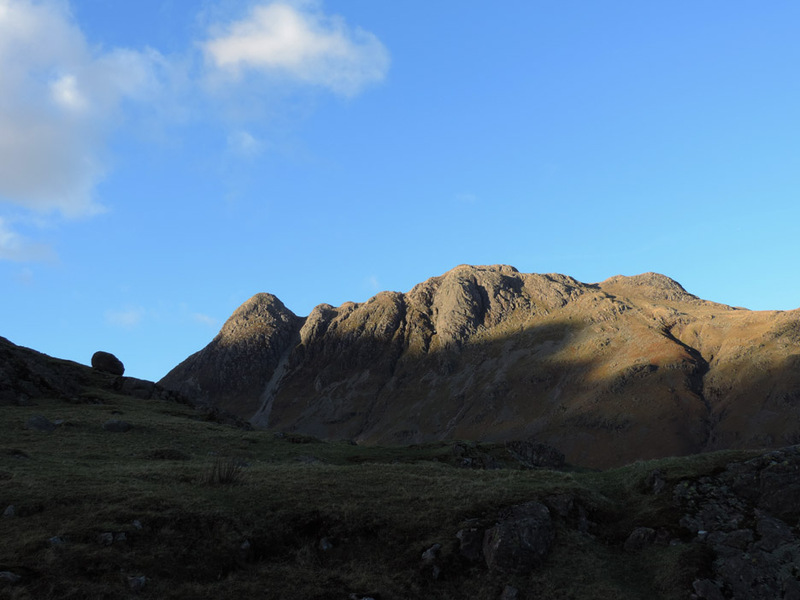 The late afternoon sun is casting the shadow of Bowfell onto the face of The Pikes. 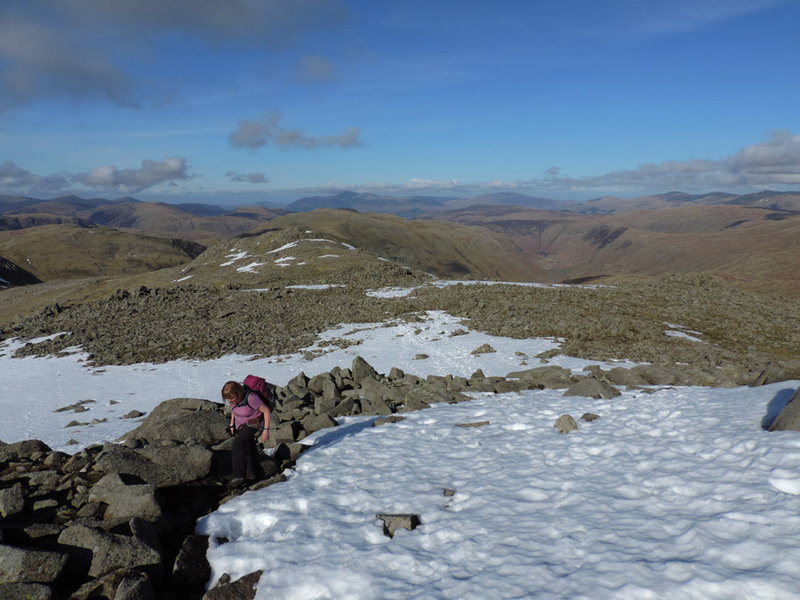 As we descend the shadow climbs higher, leaving just the summit crags in bright sunshine. 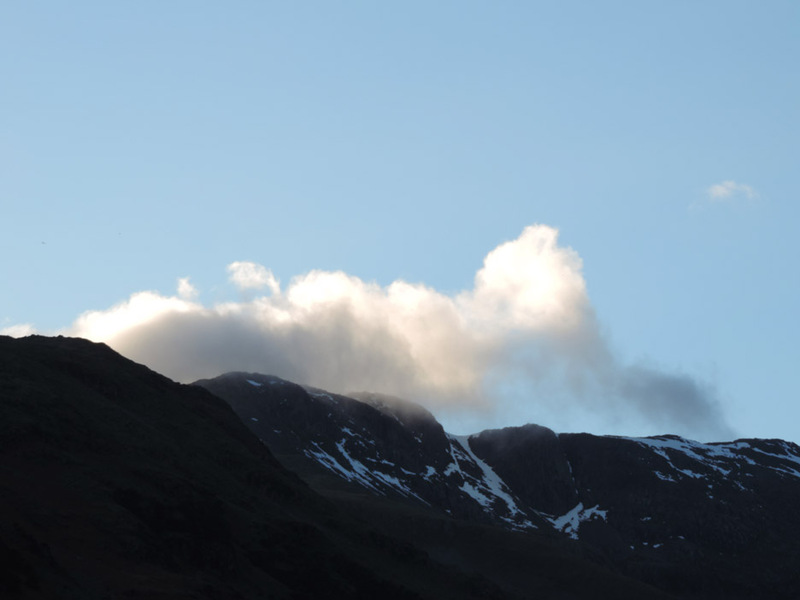 A little of that cloud brushes the summit of Bowfell as we reach the valley. We'd had a great day . . . now to find a little light refreshment to end the day. 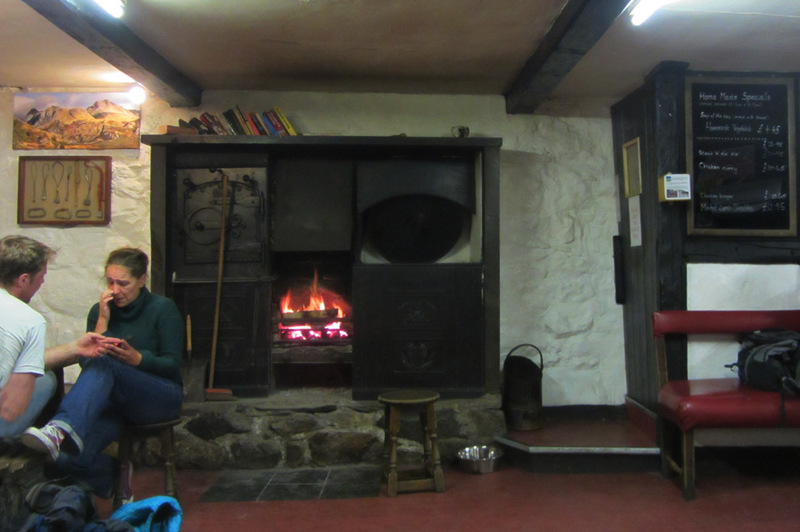 Chose a cosy log fire . . .
A scary painting of someone's dream . 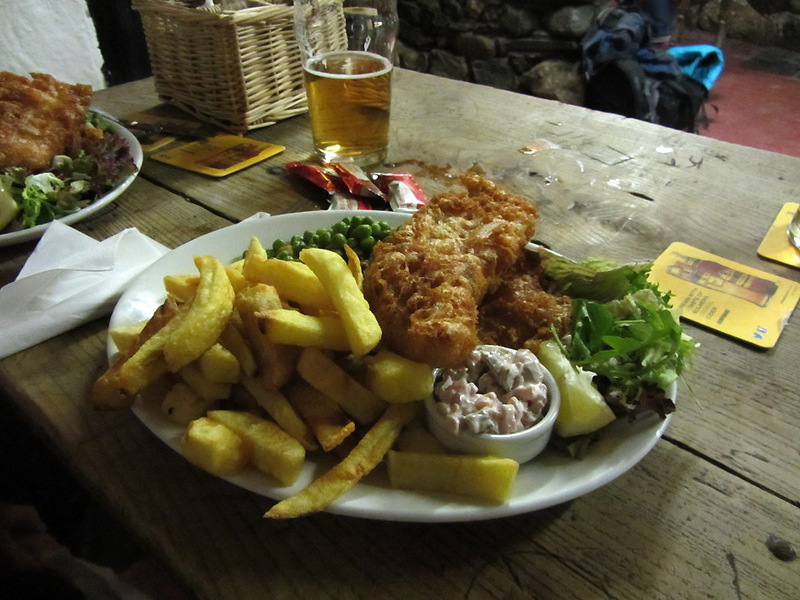 . .
A fine plate of fish and chips . 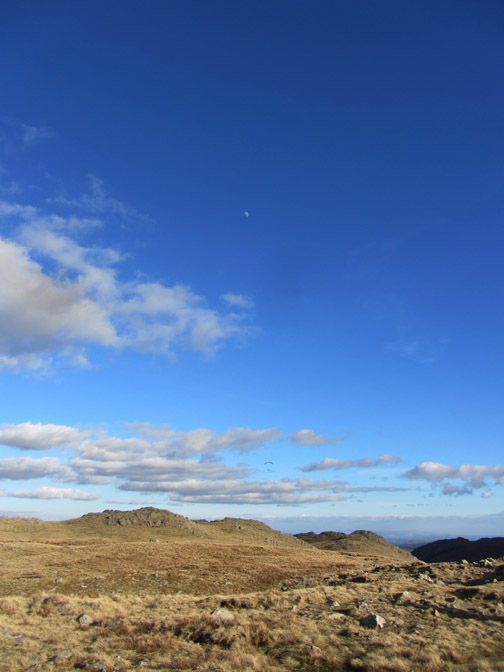 . .
the sun had set on a wonderful day on the fells. This site best viewed with . . . a job well done. 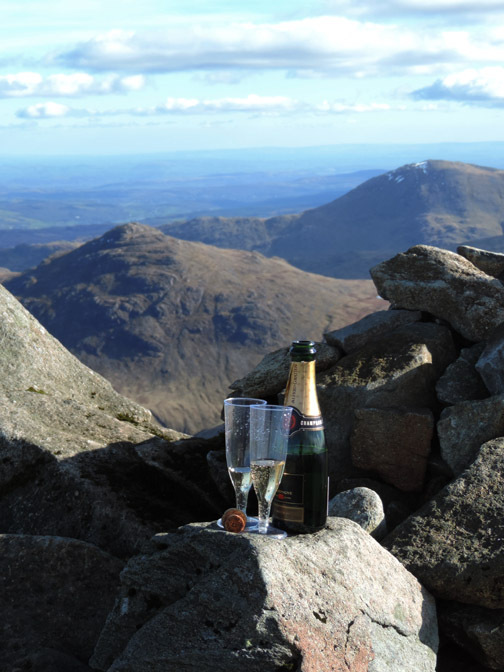 Previous celebrations - 31st December 2001 New Years Eve 2001 from "Morning to Night "
13th October 2006 A Great End to our "428 Wainwright Fells"